Background. Now we reach revelation of Christmas night. The second half of the sto ry read by Linus. There is a stark contrast of ordinary and glorious here. The angel, then angels and a heavenly choir- imagine what that would sound like. The glory of the Christ child as well, but in a manger born as a humble poor baby. And those shepherds, smelling of sheep, but the first called by God to be witnesses. This is all very deliberate and the fodder of many wonderful sermons. Don’t let the familiarity of the story stop you from hearing and appreciating its lessons. Focus Verse Luke 2:19 But Mary treasured all these words and pondered them in her heart. 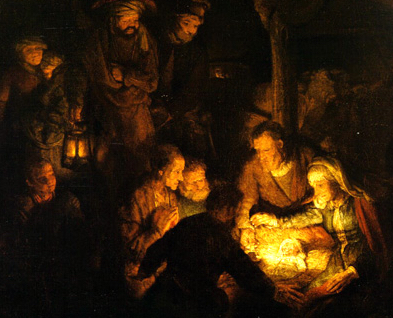 Mary hears the stories from the shepherds of what they were told by the angels. How overwhelming it must have been! We aren’t told she is confident or wise or completely at peace. We aren’t told that she sees the plan and is comfortable with it. Mary knows it all is important, and she treasures the words- stores them away- and she thinks about it all- pondering. This can be a comfort for us as well who don’t totally understand what it all means. Who feel we are still pondering. As long as we keep treasuring the words and pondering them in our hearts, we are with God as Mary was. Background: This is the version of the Christmas story that was made famous by Charlie Brown’s Christmas. It still seems profoundly simple. (check out https://www.youtube.com/watch?v=pn10FF-FQfs and listen again). There isn’t any editorializing or prophesy. There isn’t any putting it into context or explaining. Somehow that makes it more important. Read it again. Read it out loud. Listen to Linus. Focus Verse Luke 2:7 And she brought forth her firstborn son, and wrapped him in swaddling clothes, and laid him in a manger; because there was no room for them in the inn. This young brave girl, the confused but faithful Joseph, the long road riding pregnant to the little town, the concerned lost couple relegated to delivering this precious child in a manger with animals around. The story would be profound even if it was about any child, every child. But this is God himself coming to be with us. Perhaps this is why Luke kept it straightforward. Read it again and remember it was written for you. Background: Today’s reading is a bit longer, but it is of a piece. Mary has left, so the focus is back on Elizabeth and Zechariah. Elizabeth delivers her child, who will become John the Baptist. After 9 months of being muted by his doubt, now Zechariah acknowledges the truth and the Angels message when he writes down that John will be the name of his son. He again can speak, and like Mary, breaks into a song-like praise and thanksgiving. Note that unlike Mary, Zechariah’s praise is not really from a personal perspective, but as a senior member in the Jewish culture. He sings praise for the completion of the promise given to Israel. He begins what his son will carry on, telling people what is coming. What more could we wish for Christmas? What more could be we grateful for? Tender mercy from a God that brings light. And in that light, we can see our way to peace. There may be darkness in our lives, but we don’t need to say there. That is something to be thankful for. Background: Mary rushes to Elizabeth and we don’t know why. Perhaps she was excited to hear her cousin who was barren was with child. Perhaps she wanted to be with someone who would believe her about the miracles that were happening to them. One thing we do know is that Elizabeth was overjoyed to see Mary and recognizes her as the mother of the savior. While the baby who will be John the Baptist jumps for joy as well. Mary responds with a now famous prayer that has been but into many songs. This “magnificat” is an inspired expression of her gratitude and wonder. How doese this young girl can have such wisdom to see past the socially dangerous situation she is in and the overwhelming message that she is carrying the savior. She sees the glory of God in it all. God works through Mary and we can listen to her words and hear how we can understand ourselves as part of God’s plan. While this sounds beautiful-but what does it mean to have one’s soul magnify the Lord. There is actually some discussion on what it means. We think of magnification like a microscope, but those weren’t invented yet. It could mean that like it amplifies- her soul is filled with God’s song, or it could mean bringing God closer. Listen to the whole phrase and hear the joy in this young girl’s voice, her soul sees the magnitude of the Lord and the joy of having this God be her savior. Amidst a confusion time, Mary holds tight to her God and gratitude. Background: We have heard this story often, but each time it is so amazing. Zechariah and Elizabeth are introduced with a discussion of their standing, faith, and seniority. Mary is just a young girl, engaged to be married. Mary is not chosen based on status, or even her own need, she is just “favored”. In subsequent stories we get hints of Mary’s strengths and faith, but here she is just a young girl, probably in early teens. Note that when Luke is writing this it is before the doctrine of the Trinity had been introduced, but his description of her conception of Jesus by a miracle of God places him as the son of God in a profound way. Focus Verse: Luke 1:38 Then Mary said, “Here am I, the servant of the Lord; let it be with me according to your word.” Then the angel departed from her. This statement from Mary is one of the most inspiring of bible. She has been faced with an angel who has told her that she, a virgin, will conceive a child that would be great- a savior! She was engaged, so becoming pregnant was a social disaster!! Unlike the miracle of Elizabeth’s conception, this was without precedence. But Mary said “let it be”. Wow! To put herself in God’s hands showed a level of trust that we must envy. It was not to be an easy road for Mary, and she would need great strength and love. God loved her, and she trusted in that above all else. This advent season, as we light candles and remember Mary, let’s not just remember that sweet innocence, but also that strength, love, and trust. The famous “Madonna” smile is one that both loves and challenges us to face God and take the path he leads us in. Background There is a contrast between the way Zechariah and Elizabeth accept the blessing God is offering. Zechariah doesn’t believe it and challenges the Gabriel to how it could be true. He is silenced by God until the birth due to this- unable to spread the news he was unable to believe. Elizabeth accepts what is happening to her, she knows against all odds she is pregnant, and with no angelic visit, still realizes this is a gift from God. In her time, Elizabeth was viewed as cursed because you passed on the continuity of God’s promise to your children, so she had failed in some people’s eyes. The pragmatist might struggle with details of this passage, certainly we would disagree that Elizabeth should feel disgraced (not graced), and we also might wonder what the time frame was before she believed, or even if her husband passed her a note. However, there is a focus here of the faith in and power of God to do the unexpected. Zechariah failed to accept the good news. Keep in mind, he has read and knows deeply the stories of Sarah, and Rachel, and Hannah. This isn’t first time this promise has been made and kept by God. However, he asks for proof, or why he should believe. It is one thing to read about the power of God, another to see it come to you and speak. Do you see yourself in Zechariah, or in Elizabeth with her faith in what God is doing through her? A bit of both? But, while punished in some respects, it is important to remember that the blessing was still given to Zechariah even as he struggled with his faith. God doesn’t demand faith to work for us and through us. Background An angel comes to Zechariah while he is in temple acting as priest. At that time if there were too many priests, they would take turns. Note how much emphasis there is on this pious Jew, the central role of the temple and its priests and traditions. Luke is picking up the story of Israel and connecting it to the birth of John and then Jesus. An important point in this Gospel, as well as Acts, is the continuity of God’s plan for humanity and his convenient with the chosen people as part of that, which is continued and expanded through Jesus. I like the description of fear falling on us, like a live thing that attacks us. Poor Gabriel, in the birth narrative he is never greeted with a “yay it’s an angel- it must be good news!”. But instead, fear pounces on everyone at first. Like Zechariah, they are afraid. Can we blame them? What if an Angel appeared before you- wouldn’t you be confused, wondering if maybe they really want someone else, more important- someone more brave? It is important to notice who Gabriel does come to. It isn’t the amazing or the important, it is to young girls and old men, confused carpenters and grubby shepherds. Ultimately, it is to us, like kids in the back of the classroom without our hands up, when our good teacher knows us and our worth better than we do. Ready or not, the message is coming. Background Luke is referred to as the historian- in part because he takes a broader time view of Jesus life. Only Luke puts in as much detail before and around the birth of Jesus, as well as carries the story on in Acts past the resurrection. We will read the beginning of Luke, as stores are trying to sell Christmas, to begin to put the real story in our hearts! Today, we hear the beginning a classic Greek style introduction to Luke as narrator. His call is to teach by describing in an orderly fashion that which he has investigated and has determined is the truth based on witnesses. The story starts for Luke in a very different place than the other three Gospels. 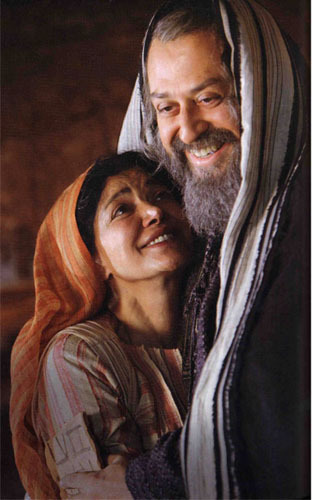 It starts with a faithful Jewish couple who are barren. Focus Verse Luke 1:7 But they had no children, because Elizabeth was barren, and both were getting on in years. It is really interesting to contrast the very beginning of each Gospel story. Take a moment and look at them- what they choose to frame the birth of Christ with. Here in Luke we start with barrenness and faith. As we started with Abraham, as we started even in the void of Genesis. Out of lack, God creates. Out of faith- God builds a covenant for the future. Out of love, God reaches across loss and confusion and life’s mess to touch our lives and remind us that he is with us. This is the ultimate lesson of Jesus, and so an apt place for Luke to begin.